The BCC Median ﬁlter makes each pixel look like the majority of its neighboring pixels. It produces a smeary painterly look, but with sharp edges (at neighborhood boundaries). The Median ﬁlter also reduces noise by eliminating “spikes,” or pixels that are very different from their neighbors (also referred to as “salt and pepper noise”). The Mode menu determines how similarity is determined between a pixel and neighboring pixels. The area is chosen by the Median Length, Median Width, and Median Angle controls, which form a rectangle that can rotate. The default setting produces a line (a very thin rectangle). When Pixel Selected by Channel is chosen, the median is calculated for the chosen channel, then the neighboring pixel(s) that have the median channel value are averaged and replace the current pixel. For example, if the Channel menu is set to Red, then the median Red value is calculated. All neighbor pixels with that same median Red channel value are averaged. When Selected Channel Only is chosen, each pixel is altered so that its chosen channel is the median value. The other aspects of the pixel remain unchanged. For example, if the Channel menu is set to Red, the Green and Blue channels are unaffected, but the Red channel is set to the median value. When RGBA Separately is chosen, each pixel is replaced by a new pixel. The four (or three, if Preserve Alpha is enabled) channels are the median values of those channels, calculated separately. When Most Common Pixel is chosen, each pixel is replaced by the neighboring pixel that is least different than the other neighbors. Use the Channel menu to specify which channel to blur. The choices are Luminance, Lightness, Brightness, Hue, Saturation, Alpha, Red, Green, or Blue. The Preserve Alpha checkbox determines whether the blur uses alpha channel information. With Preserve Alpha selected, the blur does not appear in areas governed by the alpha channel (in other words the effect has zero opacity in alpha areas), with Preserve Alpha deselected, the effect is 100% opaque over the alpha channel. Median Length and Median Width set the width of the median blur on the X-axis and the Y- axis, respectively. Median Angle sets the angle of the median blur. The Enable Fractional checkbox allows you to smoothly animate Median Length and Median Width by blending two passes of the effect. The fractional parts of the length and width control the blend. Median Level controls the amount of blur applied to the chosen pixels. At a value of 0, no blur is applied. 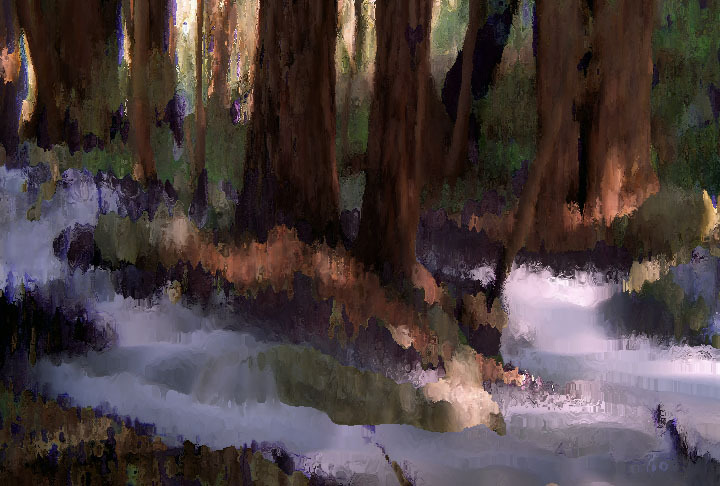 Higher values produce more blur. Softness controls the softness of the edges between affected and unaffected pixels. Increasing Softness produces a blur with softer edges. The Compositing menu sets how the blur is applied to the image, using the available Apply Modes. For more information about the Apply Modes, Click Here. However, this menu includes three additional Apply Modes, None, Under and Over. None simply renders the blur and ignores the underlying image. Under renders the blur under the underlying image. The blur is only visible in areas where the image is transparent. This is most useful for images with an alpha channel. Over renders the blur over the underlying image. Mix with Original blends the source and ﬁltered images. Use this parameter to animate the effect from the unﬁltered to the ﬁltered image without adjusting other settings, or to reduce the affect of the ﬁlter by mixing it with the source image. At a value of 0, the image is unaffected by the ﬁlter. The BCC Motion Tracker allows you to track the motion of an object, then use the motion path to drive other geometric properties of the effect without the need for keyframing. For more information on the Motion Tracker, Click Here.